Launceston R/C is proud to present their first sanctioned state title, the Fergies Betta 2018 AARCMCC Tasmanian Electric Off Road Titles to be held on the 18th and 19th of August 2018 embracing our ability to race regardless of the temperature and weather outside! So throw on your warmest clothes (or your most tropical ones to ward off the cold) and let’s get racing! This two day race meeting will bring together the best drivers from around Tasmania and Australia for two days of intense indoor, electric R/C car racing with a range of classes providing an option for just about every EP R/C Off Road racer. Our regular Launceston R/C Cup is normally open to members and non members alike, however as a sanctioned AARCMCC event we can only accept entries from people who are members of AARCMCC affiliated clubs. However Launceston R/C always welcomes new members, and most certainly welcomes spectators! Sponsorships: We are on the hunt for sponsors, so if you know of any businesses that may be interested please let Richard Green know at greeny@richardgreenphotography.com.au. Raffle: There will be a raffle run over Saturday, and drawn at the conclusion of racing that day, for a number of Proline tyres donated by Proline Racing Australia. Please find the raffle books at the canteen at the track. Classes Saturday: 2wd Buggy Stock, 2wd Buggy Modified, Stadium Truck, Novice. Full details including rules for each class below. Any class may be removed if numbers do not reach at least 8 vehicles. You can not cross enter Stock and Modified 2wd Buggy, or 2wd Stock and 2wd Junior. Classes Sunday: 2wd Short Course Truck, 4wd 10th Buggy Stock, 4wd 10th Buggy Modified, Junior. Full details including rules for each class below. Control Tyres: As a AARCMCC sanctioned State titles, there will be a control tyre for all driven wheels (rear tyres on most vehicles, and fronts on 4wd only). Those tyres are Proline Pyramid, Wedge, Prism and Pin Point depending on class. Non driven tyres on 2wd are open still. The club is making a bulk order of tyres from Sponsor Proline Australia. A limited quality of 2wd Front: Wedge Squared 2.2″ Z3 8230-103 for $20 a pair will be available at the track. Control tyres and optionally available fronts are as below. Cost: $30 for 1 class, $50 for 2 classes, $60 for three classes and $70 for four classes. Maximum of two classes per entrant, per day. Payments must be made via direct deposit using your entry ID as a reference. Junior Entries only $10. Payments must be received at least 1 week before the event. Concours: Prize for best-presented car in each chassis class. The trophy will be presented after the drivers briefing. Rules and Regulations: Rules for each class are outlined below. Race format and general event guidelines are as per AARCMCC regulations. We hope this is a weekend that will be heavy on fun, and light on scrutineering and heavy-handed rule enforcement. Your cooperation will help make sure this is the case. There will be no unsportsmanlike behaviour or intentional abuse of equipment will be tolerated. No participant is to make offensive, disparaging or insulting remarks about any other participant, official, volunteer or spectator. Any behaviour or conduct which is considered to bring the sport into disrepute will not be tolerated. All batteries must be 2S Li-Poly Hard Case and be on the approved battery list by BRCA or ROAR as per AARCMCC regulations. All batteries must be charged in a Lipo sack. Track: For those who haven’t visited Launceston R/C before, the track surface has been evolving over the years to where the majority of the surface is carpet or artificial turf with man made jumps, humps and other artificial obstacles. As per AARCMCC regulations the track will have a fresh layout for the State Title. Site Location & Travel Guide: Launceston R/C Operates from Quercus park located just before 435 Oaks Road, Carrick. This site is 15 minutes from Launceston, or from Launceston Airport respectively. There is a significant variety of accommodation available in the Launceston and Hadspen areas in a variety of types and price ranges. There is also a number of Car Rental agencies available at Launceston Airport. Site Layout: Inside the Uniquely Pavillion will be the same as normal with race control, the canteen and drivers stand in the normal locations. It is anticipated that we will have a number of other groups and clubs displaying on the Sunday. 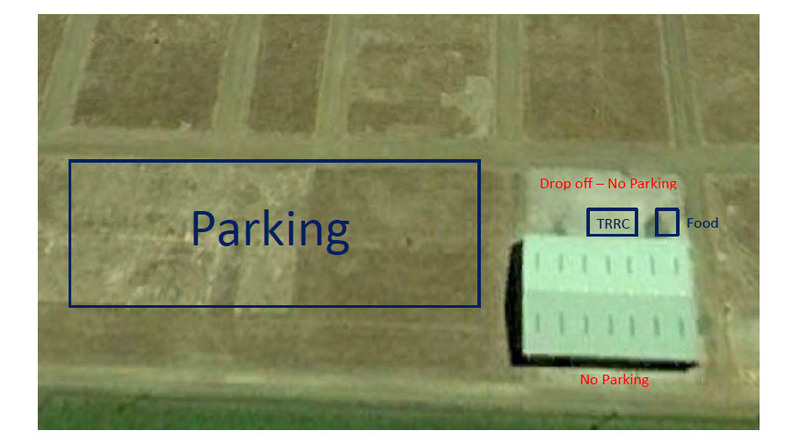 This will be a Drop Off Only Zone for both days of the state title, with parking to the west of the pavillion as per the map below. There will be NO PARKING on the southern side of the pavillion. Food & Drink: We are proud to announce that Sailor Food Truck will be on site for Saturday and Sunday allowing purchase of delicious food and drinks. They are an exciting new Food Truck offering fresh Tassie produce; Calamari, Octopus, Mussels, Dinosaur Beef Ribs, King Island Cray Fish, burgers and more. For Coffee we are pleased to announce that Little Red Coffee will be bringing their van out on Saturday and Sunday to help keep up the caffeine supply to everybody for the weekend. Make sure you head over and like their facebook page too https://www.facebook.com/Little-Red-Coffee-Food-Van-411169036014395/ ! A practice session will open on Friday the 17th of August at 10:00 am. The track will close at 9:00pm precisely. Launceston R/C races every 2nd Friday night, and visitors are always welcome. Doors open by 6pm, with racing starting at 7. Controlled practice 8:00 – 8:45 AM Saturday and Sunday 18th and 19th of August. Open to any 1:10 scale vehicles including buggies, stadium trucks and short course trucks.